While Cole Michaels is the overconfident singer in a popular local band. His charisma, emerald green eyes, tattoos and piercing, have girls falling at his feet. But while Cole pushes Tara’s buttons, he also pushes her to reach for the stars. Both men couldn’t be more polar opposites, but both offer Tara different qualities that she needs to fulfil her destiny. 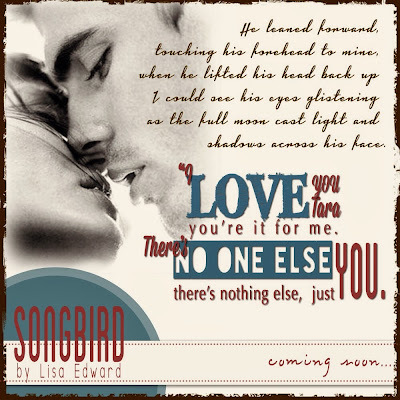 In *Songbird*, we meet Tara, a woman whose confidence and self-worth has been shattered due to an abusive relationship that she was in with Stephen. And in the opening she is gathering her things and moving in with her friend Kelli. 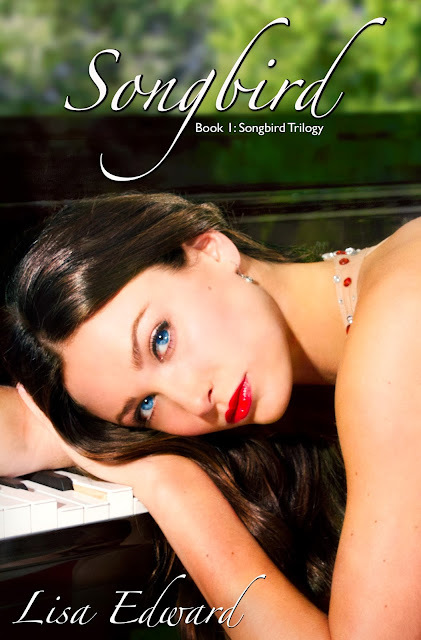 begins this journey of rediscovering herself and her passion for music and meets two very different men: Riley and Cole. A love triangle!! I love these. And I usually have a tough time deciding who I really love, and want the main character to be with-but for me, I really loved one of them.Riley’s one of those guys you dream about, good looking, funny, sweet, and caring. Tara meets Riley from Kelli’s boyfriend, Cooper and the two begin a serious and long distance relationship. Riley's the definition of sweet, charismatic, and also makes Tara feel appreciated for once in her life. The only downside to him is that he is in the military special forces, like Kelli’s boyfriend Cooper. And he is about to be deployed. Cole is like the bad boy that girls go for but get their hearts broken because he’s unattainable. But then he shows Tara his sweet, genuine side and she really gets butterflies over him. Since this is a story, the moment he meets Tara ~he pursues her, much to Tara’s dilemma. Ever loyal to Riley, Tara does not give into temptation even though she feels this attraction to Cole and a common love for music. We discover more about him and he has some tattoos that speak deeply about him. He reminded me a bit of Kellan Kyle from Thoughtless. He has his bad boy image, but there is also a lot of hurt being covered up. I feel like he is one of those characters that can change for the right girl, he can stop slutting around when he find the right one. Sometimes I think Riley can be too perfect, he does keep a small secret from Tara, which causes her to go ballistic, and it’s Cole who is there to pick up the pieces. Cole spends a lot of time with Tara, cheering her up, making her feel good when she needed it. But then Riley comes back! I mean it’s like a whirlwind of emotions swept into a 400 page book! The last half of the book really kicked things up a notch.The excitement and drama kept me turning the pages and I can't wait to find out where their relationship takes them in the next book. It is kind of a cliffhanger, as we are left with lots of unanswered questions. And we have to wait until April 2014!!! NOOOOOOO!! I must know now!! Who will she pick? What will become of Kelli and Cooper? So many questions!! Good job Lisa, I am counting down the days until April. I helped bus the tables as I was pretty useless at pulling beers. I had lost track of time when I felt my phone buzz in my skirt pocket. I raced into the back room and just managed to answer the call in time. It was Riley and my heart melted at the sound of his voice. “Where are you?” he asked, obviously able to hear the band playing in the background. I told him excitedly about catching up with Jay and lining up the band to meet Marcus, and how I was now bussing tables at the bar. For some reason I felt the need to avoid mentioning Cole. But Riley could hear him singing in the background and commented on his voice. “Ah, yep he does have a great voice,” I said, feeling guilty when I hadn’t done anything to feel guilty about. Then I changed the subject and asked Riley what he had been up to. We had only been speaking for about fifteen minutes when the band stopped for a break, and then the door opened and Cole was standing there. He could see I was on the phone but didn’t seem to care, as he came in and pulled off his sweat soaked t-shirt, before rummaging in a bag and pulling out a clean one. I looked at his shirtless body in awe. Not only did he have the full sleeve of tattoos up his left arm, but he had angel wings, or was that eagle wings across his shoulder blades. He turned around to face me and saw me looking at him, so stood still and cockily held his arms out to the sides so I could get a good look, watching my expression. I couldn’t help it, I exhaled loudly at the sight of his ripped body. Finally, I managed to tear my eyes away from his amazing body and turn my back to him. I heard him chuckle softly. Then realising that the bar would be busy with people buying drinks now that the band was on a break, I reluctantly told Riley I would have to go. “I love you too.” Then he was gone. “Hmm, I take it that wasn’t your mum,” Cole said. “Boyfriend not around at the moment?” he asked with a smirk. “He’s in the army, based in Sydney,” I replied as I headed for the door. “Must get lonely,” he said with a glint in his eye as he pulled his clean shirt on over his head. While Lisa Edward has called Melbourne Australia home for her entire life, she has lived and worked in England, and travelled through most parts of Europe and the United States. She loves nothing more than spending time with her husband and beautiful daughter, or curling up into the early hours of the morning with a great novel. Her deep appreciation for literature was nurtured from a young age, being taught to respect books and get lost in their stories. 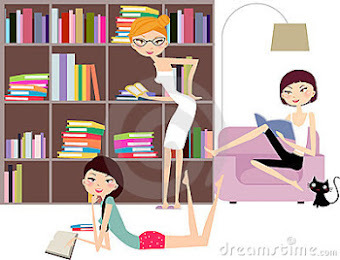 She enjoys reading honest and realistic novels that are relatable, thought provoking and leave a lasting impression. She can’t write without music playing, using the emotions from different songs to invoke that of her characters. Lisa takes inspiration from her own life experiences, the people around her and those she has met in her travels.